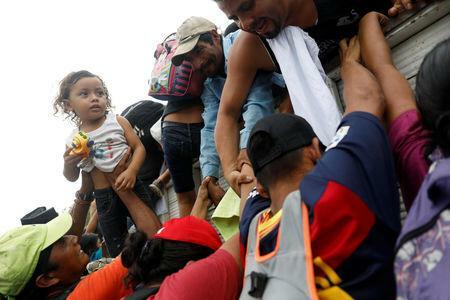 Several thousand people are now part of the caravan, according to a Reuters witness traveling with the group in Guatemala, where men women and children on foot and riding in trucks filled a road on their long journey to Mexico. "We've lived in neighborhoods where our children have seen disaster after disaster," said Daisy Turcios, resting briefly outside a school. "We have seen dead bodies thrown in front of us. So that's my goal, in truth, to reach a country where life can change for my children." "Whatever money I have, I need it to buy drinks for my son, fruit," she said. 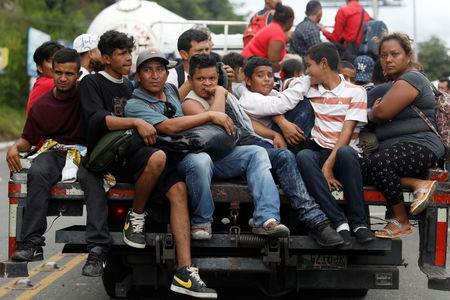 Some friendly Guatemalans had offered rides, she said, but "everyone wants to get on" so they would have to walk. Later on Wednesday, Guatemalan President Jimmy Morales said his government rejected constraints placed on foreign aid. "No help can be conditioned and no help can be demanded," Morales told reporters following an event in the Guatemalan capital. U.S. President Donald Trump decried "horrendous weak and outdated immigration laws," in a series of Twitter messages starting on Tuesday. 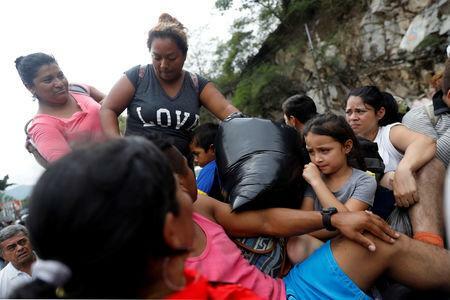 He threatened to cut off aid to Honduras, Guatemala and El Salvador if they fail to prevent undocumented immigrants from heading to the United States.